Following advanced tooth loss, it’s important that you replace teeth as soon as possible. Each day patients spend without functional teeth is a day they will struggle to consume a healthy diet, speak clearly, and smile with confidence. At Esplanade Dental Care of Downers Grove, we offer custom crafted partial and full dentures to put the smile back on your face. Whether you’re missing a single tooth or a complete row of teeth, call our Downers Grove dentist and dentistry team to schedule a tooth replacement consultation appointment at Esplanade Dental Care. During your consultation visit, we’ll examine your smile, review your treatment options, and help you plan to restore your smile. Partial dentures are used to fill in the gaps between healthy teeth. A gum-colored base material is crafted to fit between remaining dental structures and support prosthetic teeth. The partial denture is held in place with clasps attached to surrounding healthy teeth. 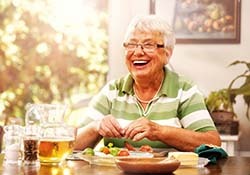 You can remove and replace the partial denture easily for cleaning each day, and in the majority of cases, patients are able to chew a wide array of nutritious foods. 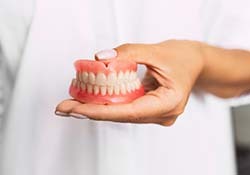 Full dentures are also made using a gum colored base, but they replace an entire arch of teeth. The base is molded to fit against the gum line, creating natural suction that holds the denture in position. Patients who want a little extra stability can add denture adhesive. Like traditional partials, full dentures are easily removed for sleep and cleaning. With a removable full denture, your diet will be partially limited, but when properly fitted, dentures can restore as much as 20% of chewing function. Dental implant supported dentures offer the maximum level of natural chewing function. In most cases, a partial or full denture can be supported by three to six implant posts. If you choose to receive an implant retained denture, you can either elect fixed or removable prosthetics. For some patients, the removable implant dentures are best to ensure ease of cleaning, but the semi-permanent fixed implant dentures offer the longest lasting, most natural results. If you have a removable denture, you should take it out at night for cleaning. Brush the denture using a soft bristled toothbrush. Then, store your denture in water or cleaning fluid overnight. If you have healthy teeth remaining, you should continue to brush and floss them after removing your denture and before replacing it each day. If you do not have any healthy teeth remaining, you can gently brush your gums to remove plaque buildup or use an antimicrobial mouth rinse. Patients who have fixed implant retained dentures can brush them like healthy natural teeth. You may need to use a specialized flossing tool like a water flosser to remove plaque buildup between dentures and soft tissue to avoid gum disease that can lead to dental implant failure. You should also visit our office twice each year for checkups and teeth cleanings.